The internal parts of a lawnmower engine will seize from lack of use or an insufficient oil supply. Oxidation of the internal components of the engine will make the mower impossible to start. To avoid this scenario, change the lawn mower's engine oil at scheduled intervals set forth by the manufacturer's guidelines. 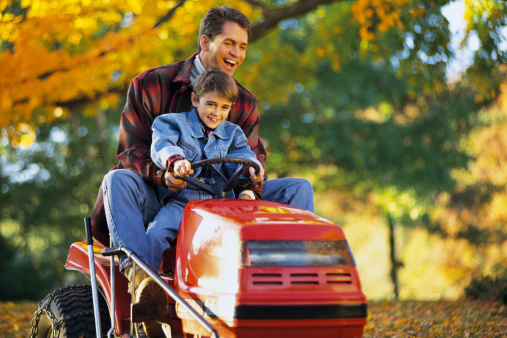 Keep oxidation of the internal engine components to a minimum by running the lawn mower engine at least once a year. Always keep the lawn mower stored in a garage or shed, away from the elements. Purchase a can of penetrating oil spray. Drain the engine of all the oil. Remove the spark plug from the lawnmower's engine. Setup the lawnmower with the spark plug hole facing up (riding mowers will require the owner to remove the engine to accomplish this). Spray a liberal amount of penetrating oil in the spark plug hole. Let the penetrating oil set and soak in the combustion chamber for an hour. Attempt to move the engines piston up and down the bore by gripping the mower blade and moving it back and forth. Do this until the engine rotates freely (riding mowers with the engine removed will need leverage on the crankshaft from a pair of locking pliers). Put the lawnmower on its wheels and install the removed spark plug, fill the engine with the appropriate type and amount of oil recommended by the manufacturer. 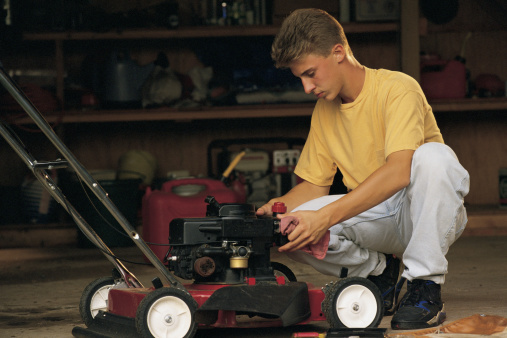 For those with riding mowers, install the engine before replacing the spark plug and filling with oil. Start the lawnmower and let it run for five minutes.